Sheila Dillon celebrates the power of food to comfort us in hard times: a feast of dumplings, marshmallows, chicken soup, fried chicken - and curried goat. Fry the onions very slowly for 10 minutes on a low heat, add the garlic for another 5 minutes. Add the carrots and celery (chopped into 2 cm pieces), fry for 5 minutes. Allow the soup to cool completely and remove any fat from the top with kitchen towel. 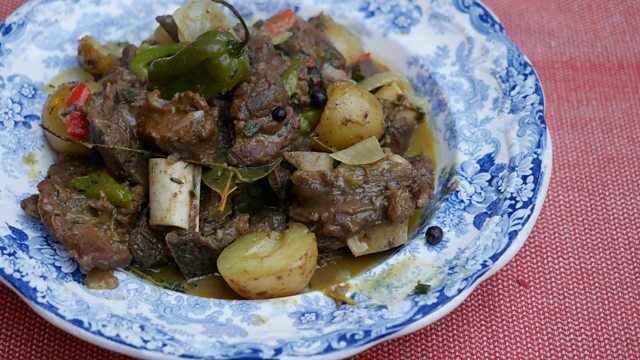 Place the goat into a large bowl and add the lime juice, curry powder and all-purpose seasoning. Mix well to coat the meat in the seasoning, then cover with clinf film and marinate in the fridge for four hours. Heat a large non-stick casserole or heavy-based pan until very hot, then add the groundnut oil. When the oil is nearly smoking, add the goat and turn the meat in the oil until well coated. Cover the pan with a lid and turn the heat down to low. Cook for 45 minutes, checking the meat every so often to ensure it isnt browning too much on the bottom. Increase the heat, add 150ml of the stock and bring to the boil. Turn the heat back down and simmer for another 45 minutes. Add another 150ml of stock and cook for a further 45 minutes. Add the onion, ginger, chilli, garlic and allspice berries and stir gently. Add all of the remaining ingredients except for the potato, herbs and rice. Bring to the boil, then turn the heat down, cover and cook for another two hours, stirring occasionally. Add more stock if the mixture seems too dry. About 20 minutes before the end of cooking time, add the potatoes. When the potatoes are cooked and the goat is very tender, season to taste with salt and freshly ground black pepper. To serve, spoon the curry alongside some boiled rice and garnish with the fresh chopped herbs. Jill Archer is a loving but controlling matriarch who rules the roost at Brookfield Farm in Ambridge. She's famous for her ability to calm any situation with a home-baking solution. Her flapjacks are legendary and have huge emotional currency in the family. Here is the recipe for Jill's flapjack. Use it carefully.